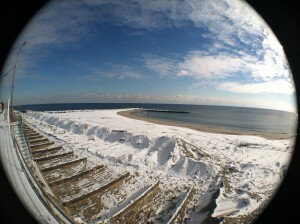 Snow from January 25, 2013 covers the beach. Work has started on the beach to expose the old cabana foundation pilings. Employee, Stephen Rogers, has experimented with his new fish-eye lens.